The Sagrada Família is the symbol of Barcelona. The construction of the ‘Holy Family’ church began in 1882, but the completion of Gaudí’s masterpiece seems Barcelona’s biggest mystery. What is the Sagrada Família and why is it a must-visit? The Sagrada Família (literal meaning: ‘Holy Family’) is a church in the neighbourhood of Eixample in Barcelona and the most visited monument of the city. 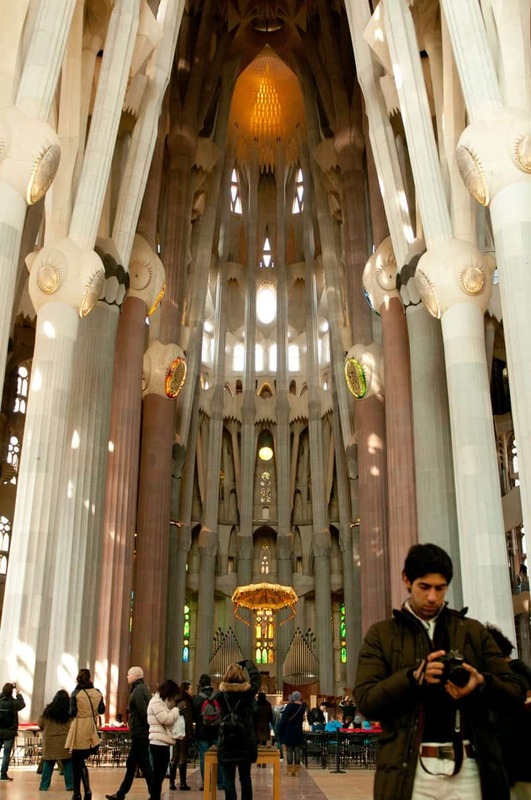 People from around the world especially come to Barcelona to see the basilica, some because of the architecture, others out of religious motives. The Sagrada Família is the most famous work of the modernist architect Antoni Gaudí. Its unique shapes and structure make it completely different from other churches in the world. It’s also a symbol of Barcelona and of Catalan Modernism. If there is one attraction you can’t miss durnig your visit, it’s the Sagrada Família! Gaudí’s temple, with more than three million visitors every year, is the most visited monument in the whole of Spain. For more background, history and architecture of the Sagrada Família, scroll further down. To visit Barcelona and not see the Sagrada Família is like going to Paris for the first time and skipping the Eiffel Tower. It will take roughly an hour and a half for a regular visit, and two hours if you climb one of the towers. One of the most spectacular features of the Sagrada Família is the beautiful light from its enormous stained glass windows — which varies in color throughout the day. Early in the morning the light is cooler with blue and green tones being more common, while later in the day you’ll see more oranges, yellows and reds. When you visit the towers of the Sagrada Família, you’ll have to leave your backpack in a special locker before entering the elevator. You’ll need coins (50 cents or 1 euro) for this, so make sure you have some on you. The area around the Sagrada Família features a lot of fast food chains and souvenir shops — not particularly interesting. After visiting the Basilica you can head north to Sant Pau Recinte Modernista, or to Passeig de Gràcia, where you’ll find the Casa Milà and Casa Batlló, also by Gaudí. La Casa de les Punxes is also nearby. For a wonderful view of La Sagrada Família, visit Hotel Majestic’s rooftop terrace, on Paseo de Gracia. As with many Catholic temples, there are several clothing restrictions. Make sure your clothing is suitable when you visit. Hats, caps and anything that covers the head is not permitted, with the exception of head covers that are related to one’s faith or due to health reasons. Shoulders must be covered. Tank-tops, short shorts, skirts above the knee, and garments that show the belly of have open backs aren’t allowed. Finally, clothes that draw special attention aren’t allowed either, such as for bachelor parties, regardless of religious purposes. What is the best time to visit the Sagrada Família? Generally speaking the temple is least crowded in the morning on weekdays. If you book your tickets for 9 o’clock in the morning on a Tuesday there will still be people (the Sagrada Família receives over 3 million visitors a year so it’s always busy! ), but less so than if you went on a weekend or later in the day. Because the lines can be very long, we recommend you buy your tickets in advance. In case you don’t have tickets yet, try to plan your visit as early as possible. People can already be waiting in line before opening hours. Don’t forget to bring sunscreen, water and a hat for the sun, in case the temperatures are high. The ticket office where you can purchase entrance tickets is located at the Carrer de Sardenya, in front of the Passion Facade. If you book your tickets online in advance you can skip the long waiting lines. There are 4 different types of tickets to choose from, with reduced rates for under-30’s, seniors and students. Children under age 11 enter for free. You can print your tickets at home or download them on your smartphone and show them at the door. The easiest and best way to buy your tickets in advance is via our partner Ticketbar. With the ticket you’ll get an audio guide app for your smartphone. Cost is €15 for adults, €13 for students and under-30’s, and €11 for seniors. Visit to one of the towers too. The view is really worth it. This option doesn’t include the audio-app but it does include the audio guide of the Sagrada Família. Cost is €29 for adults, €27 for students and under-30’s, and €22 for seniors. Combination ticket for the Sagrada Família and the Hop On Hop Off-bus. If you planned to do both, this ticket will be the cheapest option. Cost is €56 for adults, €40 for children between 10 and 17, and €15 for 4-9. Children under 4 enter for free. 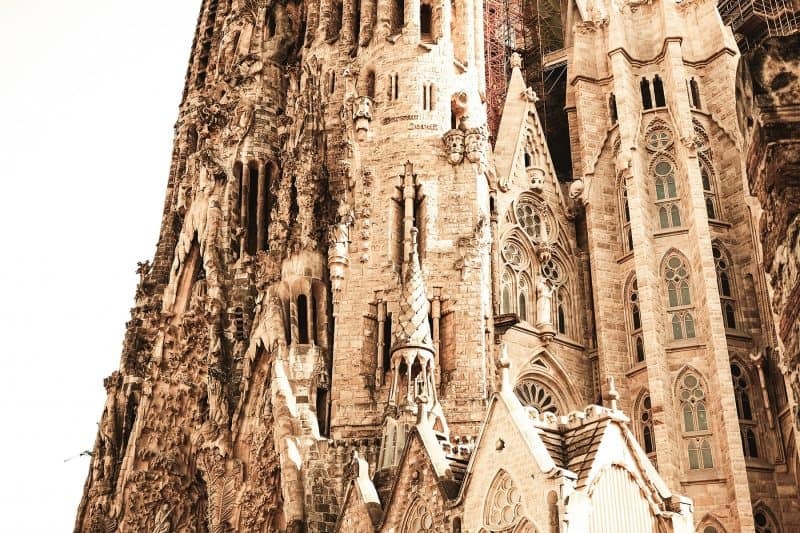 You can go on a tour with a professional guide to learn even more about the history of the basilica and Gaudí’s life. The entrance fee is included in your tour, so no need to wait in the line. Cost is €29.50 for adults and €26 for children between 10 and 17. Children under 10 enter for free. Unemployed people can visit the Sagrada Família for free on Wednesday evenings. But Note: only people that are unemployed in Spain upon presentation of their unemployment documents. Disabled people and visitors with a handicap of over 65% can visit the Sagrada Família for free presenting their medical documentation. Note: the Sagrada Família works with time slots. This means that you have to decide in advance what time you would like to visit the church. Make sure you arrive at the entrance door on time. You can either print out your tickets or save them on your smartphone. 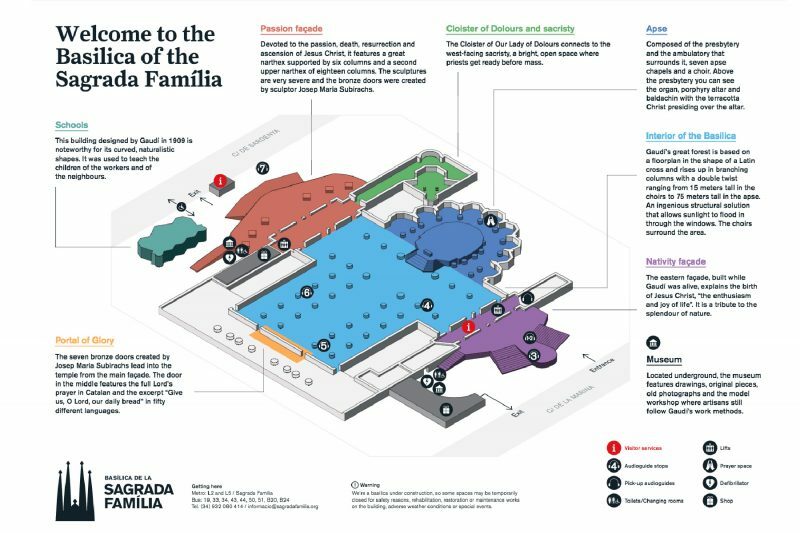 How to get to the Sagrada Família? The Sagrada Família’s address is Carrer de Mallorca, 401, 08013 Barcelona, Spain. Metro: The easiest way is to take the metro to stop Sagrada Família. Two lines stop here, the blue line L5 and purple line L2. Once you step out it’s impossible to miss Gaudí’s temple. Parking: the Sagrada Família doesn’t have its own parking, so if you come by car, you’ll need to find a parking place in the area. If you’re driving and using a GPS, just search for it by name, no need to input its location or coordinates. Hop-on hop-off bus: Both the Bus Turístic and the red buses stop at the Sagrada Família. There are tourist bus stops all over Barcelona, so check the routes and see which ones are most convenient. By bike: From the centre you can easily bike to the Sagrada Família. It will take you more or less 20 minutes, and you’ll find several places topark your bike nearby. There’s a bike path that runs along Carrer de Provença. On foot: It takes about half an hour to walk to Sagrada Família from Plaza Catalunya in the center. Use Google Maps to find the best route from your location. The entrance for ticket holders and people wanting to attend a mass is at the Nativity Facade, on Carrer de la Marina. Groups and visitors that have booked a tour use special entrances, also on the Nativity Facade near the main one. Ticket booths are located on the other side of the building, in front of the Passion Facade on Carrer de Sardenya. 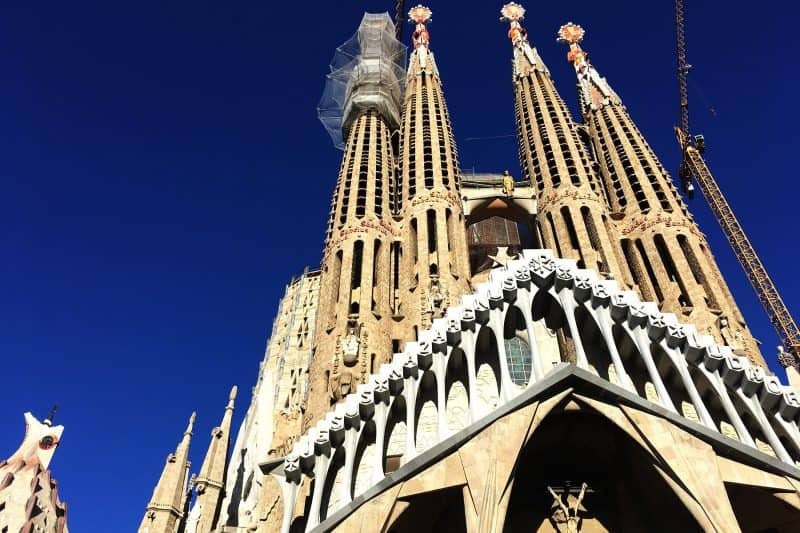 What to see and do during your visit to the Sagrada Família? If you don’t have entrance tickets you can still admire the exterior of the basilica. In front of the Nativity and Passion Facade you will find parks where you can sit and enjoy an excellent view of the church. The Sagrada Família has the shape of a Latin cross with five aisles. The three facades each symbolize a part of the life of Christ. The Nativity Facade is a UNESCO World Heritage site. This part of the Sagrada Família is located on Carrer de la Marina, from where you enter if you have bought your ticket in advance. The Nativity Facade is easily recognizable, it’s a lot darker and more ornamented than many of the more modern parts of the building. As its name suggests, the Nativity Facade represents the birth of Christ. There are also many references to nature, a constant in all of Gaudí’s work. This was the only part of the building that was finished by the time of Gaudí’s death, and thus it is the closest to his original vision for the temple. While you’re there, make sure to pause for a moment to admire the magnificently detailed Door of the Charity, by Japanese sculptor Etsuro Sotoo. In the years after Gaudí’s death, nobody cared about the completion of the Sagrada Família. In 1936 almost all of Gaudí’s original designs were lost in a fire in the crypt. In the following years numerous architects took turns running the project, but lacking the original designs there was no clear consensus on what Gaudí’s vision for the building was. In some instances, these departures from “Gaudí’s essence” angered people who wanted to stick to his roots as much as possible. In 1978, the controversial Passion Facade was completed. When visiting, you immediately see that the style of this side of the building is completely different from that of the Nativity Facade. The Passion Facade is the work of architect Josep María Subirachs, who unlike Gaudí preferred simple, quasi-austere forms and little ornamentation. The choice of this style was meant to evoke the suffering of Jesus Christ. The Facade of Glory on Carrer de Mallorca is still incomplete. For Gaudí this was the most important side of the building. The Facade of Glory refers to death, Heaven, and the glory of God. Eventually this section should become the main entrance, but in order to complete it according to Gaudí’s design two blocks of houses would have to be demolished. The project’s managers and the city council are still negotiating to decide how to proceed with construction of this section. The inside of the Sagrada Família is just as beautiful as the outside — perhaps even more so. In 2010 the main nave was completed and this makes a visit to the church even more worthwhile. Depending on the time of the day, the sunlight that filters through the stained glass windows is tinted blue, yellow, green, red, or orange. The spectacular lighting isn’t the only thing that will grab your attention. The white stone columns that support the vaulted ceiling are also very beautiful. Their shape, smooth and straight at the bottom and branching out at the top, mimics that of trees, giving the effect that you are in a forest. You will find other references to nature everywhere you look, such as animals, flowers and plants. Also impressive is the temple’s organ, which holds 1492 pipes. On the Facade of Glory side you can admire a five meter bronze door where the Holy Father is inscribed, followed by the sentence Give us our daily bread in many different languages. The Sagrada Família museum is located underneath the basilica, in the basement. Here you can see documents and old photos and learn more about Gaudí and the project. There are also models that show what the basilica will look like upon completion. You can also see the workshop where sculptors and stone-cutters are creating many of the decorative elements that cover the temple. A visit to the museum is included in your entrance ticket. Also in the basement you’ll find the crypt. This is where Gaudí spent the last years of his life, and it is the place where he is buried. He regularly slept in his workshop, together with his notes, plans, and a model of the temple. It’s not possible to visit the crypt, but it can be viewed from outside. You can come closer if you attend a Mass. The crypt, like the Nativity Facade, is placed on the Unesco list of Cultural World Heritage sites. The central altar has an altar piece from sculptor Josep Llimona. There are also four chapels dedicated to the Virgin of El Carmen (which holds Gaudí’s grave), Christ, the Virgin of Montserrat, and Christ at the Cross. The latter is the resting place of Josep María Bocabella, who came up with the idea to build the Sagrada Família at the end of the 19th century. The floor of the crypt is decorated with a roman mosaic with images of wheat and vines. When completed, The Sagrada Família will have a total of 18 towers. In order of ascending height and importance these symbolize the twelve Apostles, the Virgin Mary, the four Evangelists, and Jesus Christ. Still to be constructed is the central tower representing Christ between the evangelists. The shortest tower is 90 meters high. The tallest, when finished, will measure 172.5 m, making the Sagrada Família the tallest church building in the world, and the tallest building in Barcelona. An interesting fact: The reason Gaudí chose 172.5 meters as the height of the central tower is because of nearby Montjuic Hill. It is now known that its actual height is slightly over 180 meters. Which towers at the Sagrada Família should you visit? You can choose between the Nativity Facade and the towers of the Passion Facade. In the first case you look over the east of the city and in the second case the city center. We think that both towers are worth the view. If you go up the Passion Facade you get slightly higher and the Nativity Facade has a longer bridge. Unfortunately it’s not possible to visit both towers with one entrance ticket. Because of security regulations, children under age 6 are not allowed up, and children up to age 16 should always be accompanied by an adult. People with impaired mobility or vision are not allowed in the towers due to safety reasons. In case of stormy weather or heavy rain, the elevators to the towers may be closed for security reasons. If this happens, you will get a refund. Between 1908 and 1909 a school was built on the premises (Escoles de la Sagrada Família) for the children of the workers. Gaudí wanted to demolish it to increase space for the Basilica, but it ended up being left up after his death. In 2002 it was moved to the southern corner of the site, and today the old building can be visited. 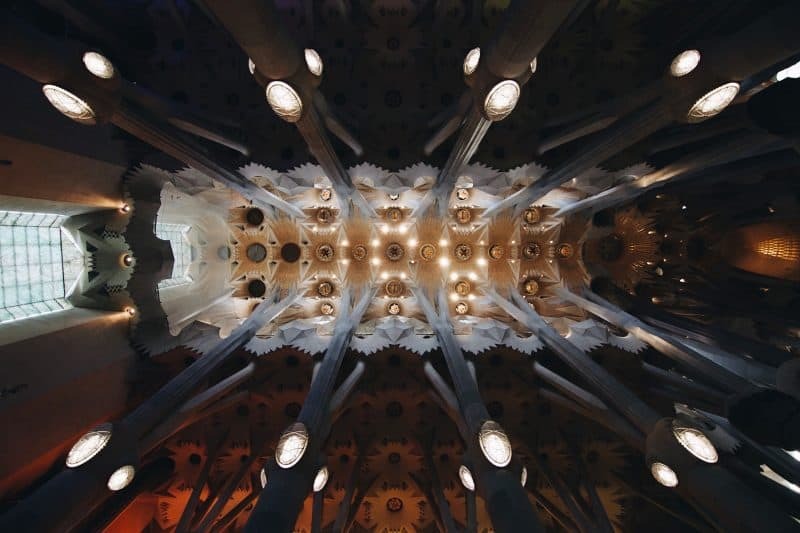 Famous architects such as Le Corbusier and Santiago Calatrava were inspired by the Sagrada Família School’s iconic design. Are you looking for a souvenir or a gift? The Sagrada Família has two gift shops. The first store is behind the elevator of the Passion Facade while the second one is at street level at the Carrer de la Marina, on the side of the Nativity Facade. The latter one is accessible without an entrance ticket. There are no restrictions on photography inside the temple, you can take pictures of whatever you want. The only time it is not allowed is during religious services. It is possible to attend a mass at the Sagrada Família, there are several possibilities. Currently, ceremonies are held in the crypt underneath the church and at the main altar. Sunday and holidays: 9 am (Spanish), 10.30 am, 11.45 am (Spanish), 1 pm, 6.30 pm (only in the winter) and 8.15 pm (Spanish). Unless otherwise specified, services are in Catalan. On Sunday at 9am there is a special international mass at the great altar in the Sagrada Família. The service is held in English, French and Italian and you can attend for free. If you attend the service you can visit the temple for free afterwards. For the international mass there are 700 seats available and 2000 standing places. The earlier you arrive, the higher the chance for a good seat. The service lasts about one hour and a half and guests must behave respectfully throughout. Be especially mindful of the dress code and limit picture-taking to the minimum. After 135 years, the Sagrada Família, considered the masterpiece of modernist architect Antoni Gaudí, is still unfinished. The aim is to complete it in 2026. 1882 – Francisco de Paula del Villar, an old acquaintance of Gaudí (they studied together), put the design on paper and the first stone was laid in 1882. 1886 – Antoni Gaudí was hired as the architect. He thought he’d need about ten years to finish the project. He estimates the project will take 10 years. 1910 – Gaudí is working exclusively on the Sagrada Família. He becomes so absorbed in the project that he moves into his workshop on site. 1926 – Gaudí is hit by a tram. He dies three days later in the hospital. The construction of the church slows down with his death. 1936 – A fire breaks out in the crypt, destroying most of Gaudí’s plans and sketches for the building. 1952 – The decision is made to bring the project to life again. New architects begin working on it and many leave their personal mark on the building. 1978 – The Passion Facade (the ‘modern’ side) is finished. 2010 – The interior of the Sagrada Família is finished. Pope Benedictus XVI consecras the temple and grants it the status of Basilica. Tens of thousands of people attend the event. 2026 – The building will (hopefully) be completed on the 100th anniversary of Gaudí’s death. The following video shows what it will look like once it’s done. Why is it taking so long to build? The fact that the church still isn’t finished is partly because of the enormous size of the project. When it is completed, the Sagrada Família will be the largest church in the world. Gaudí’s elaborate style has also caused many complications. The level of craftsmanship required to build the temple to his high standards has made work progress very slowly. But beyond the technical difficulty of the build, finance was always the biggest problem. According to the founder Josep Maria Bocabella, the Sagrada Familia should become a church of penance and therefore should be funded only with charitable donations. This turned out to be quite a tall order, and for many years Gaudí dedicated much of his time to fundraising for the temple. When asked about the project’s slow progress, Gaudí would respond by saying “My client, God, is in no hurry”. Every year, more and more tourists came to take a look at what nowadays is considered one of the most controversial masterpieces of modern architecture. In the eighties, the building commission wised up on this and realized that there was an economic opportunity. It was decided to charge an entrance fee, and with the new influx of funds the building process began to speed up. In 2010 the interior of the church was finished but the exterior parts and towers are still under construction. Currently, the project employs around 100 sculptors and builders on a permanent basis. For the last sixteen years of his life, after completing the Casa Milà (La Pedrera), Gaudí dedicated himself exclusively to the Sagrada Família. Gaudí had changed by then from a flamboyant young man to a shabbily dressed hermit and fervent catholic. Gaudí was inspired by old gothic and Byzantine cathedrals for the Sagrada Família but he decided not to follow the initial neo-gothic design of his predecessor. He wanted the Sagrada Família to embody the message of the four evangelists. He kept a maquette of the temple on his bed side table so it would always be in his thoughts. In 1926, while out on a morning walk, Gaudí was hit by a tram. At the time he was carrying no identity documents and because of his shabby clothing and unkempt appearance passersby mistook him for a beggar. It is likely that he received substandard medical treatment because of this, and by the time he was identified his health had deteriorated significantly. He died three days later in the hospital, and was buried in the Sagrada Família. With his death, work on the project slowed down considerably and it would take many years for it to pick up again. Interesting Fact: Gaudí’s face is depicted in two places in the Sagrada Família. On the Nativity Facade, as the figure that represents Joseph, and on the Passion Facade, where Veronica holds the face of Jesus with a cloth. On the Passion Facade you’ll find the magic square, created by Josep María Subirachs, who created the sculptures that decorate that portion of the building. It is one of the many riddles and enigmas that you can find throughout the Sagrada Família. In a row, the numbers of the square all add up to 33, the age of Jesus Christ when he died, but also the number of grades in the order of Freemasons. Buenas Migas: italian sandwiches, salads, smoothies and homemade ice tea, cakes and cookies, good coffee with fresh milk, teas and organic yoghurt. La Paradeta: Fish, fish and more fish. Budget €25 per person for a very satisfying meal of fish and shellfish. Closed on Mondays and between 4pm-8pm. Both la Sagrada Família and Park Güell are must sees, especially if it’s your first time in Barcelona. If you want to visit these two can’t-miss monuments on a single day read our tips below. 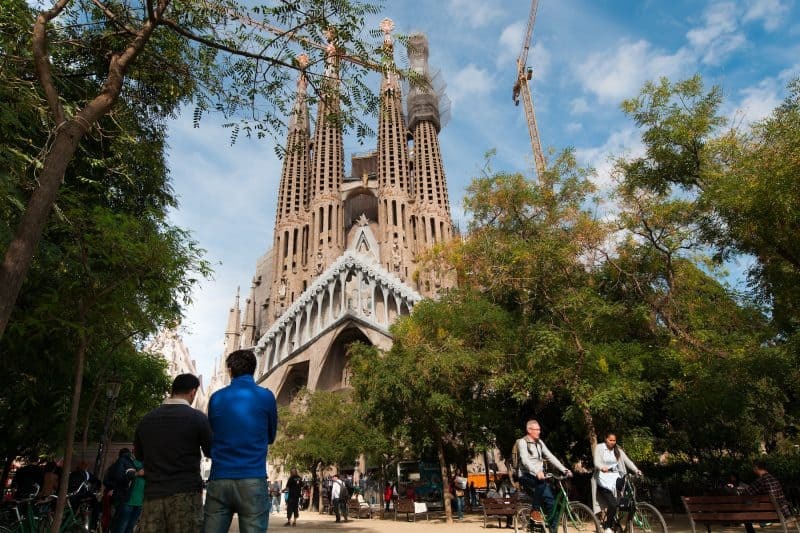 How do you get from the Sagrada Família to Park Güell? There are several ways to get from one attraction to the other. Walking, by bike, taxi, bus and metro. Good to know: the difference in elevation is significant. Keep this in mind if you plan to walk or bike. Tip: Make sure to budget enough time for your visits. The Sagrada Família usually takes between one and two hours (more if you’re visiting the towers), and Park Guell is more or less the same. Travel time between the two varies depending on your mode of transport. On foot it’s roughly ~35 minutes. If you have enough time, walk up to Park Güell and stop for lunch in the district of Gràcia. We love Sol Soler for tapas on Plaça del Sol. If you want something sweet instead, head to La Nena on Carrer Ramon i Cajal for churros and chocolate and lemon pie. Take local bus line 92 at Sant Antoni Maria Claret-Lepant, a 10 minute walk from Sagrada Família. Get off at Ctr del Carmel-Parc Güell. Get the Blue Line at Sagrada Família towards Vall D’Hebron and get off at El Coll-La Teixonera. From there it’s a 15 minute walk and the good news is that it’s downhill. You’ll also get to to enjoy a nice view of Barcelona. You can easily travel between Sagrada Família and the Park Güell on the Hop On Hop Off Bus. The Blue Line runs by both attractions and the distance is about 20 to 30 minutes. There are always enough taxis at both sides of the Sagrada that take you in about 10-20 minutes (depending on traffic) to the main entrance of Park Güell (Carrer d’Olot). Unfortunately, the answer is no. Certain groups can purchase tickets at a lower rate (children, students, seniors), but there are no special discounted tickets to visit the Sagrada Familia. Is it worth it to reserve tickets in advance? Yes. The Sagrada Familia is the most visited tourist attraction in the entire country. If you show up without a ticket you may have to wait in line for a long time, and on certain particularly busy days you may not be able to get in. Is is possible to visit the Sagrada Família at night? Not specifically. There are no night tickets or tours to visit the temple, the closest you can come is choosing the last time slots of the day in winter (the Sagrada Família closes at 6 pm between November and February). That said, if you visit very late in the day you won’t get to enjoy the illuminated stained glass windows that light up the central nave. Who designed the Sagrada Família? Catalan architect Antoni Gaudí. Gaudí was a modernist architect that lived from 1852 to 1926. He designed many iconic buildings, such as the Casa Milà, the Casa Batlló, and the famous Park Güell. 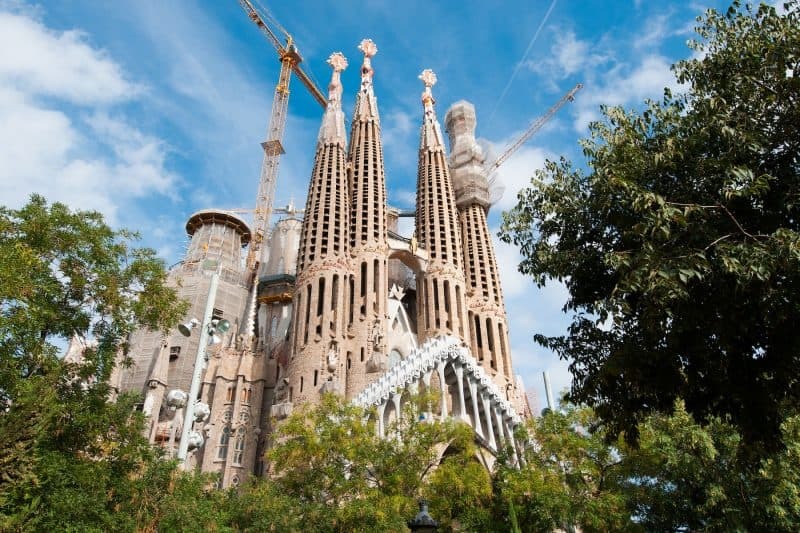 How long has the Sagrada Família been under construction? A very long time! Construction began in 1882, meaning that the building has been under construction for 136 years! When will the Sagrada Familia be finished? The current goal is 2026, the one-hundredth anniversary of Gaudí’s death. What does ‘Sagrada Família’ mean? Sagrada Família translates to “Holy Family”, and it refers to the family of Jesus Christ, and to his early followers that founded the Christian religion. ¡Hola! We’re Annebeth, Carola and Carlijn. 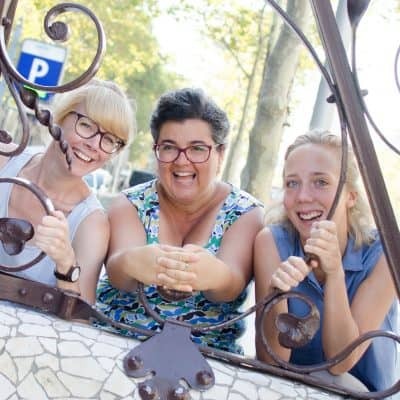 We live and work in Barcelona as journalists and tour guides, and we want to share the best this wonderful city has to offer.